This bug can bee seen in your client side trace files if you switch on support level trace in the Oracle Client’s sqlnet.ora file. (1) [15-DEC-2015 08:20:43:702] nauk5ba_fcc_retrieve: Looking for client t„„„„„„@TESTDOMAIN.COM. (1) [15-DEC-2015 08:20:43:702] nauk5ba_fcc_retrieve: Looking for service oracle/dbhost„„@TESTDOMAIN.COM. (1) [15-DEC-2015 08:20:43:702] snauk5g_open_file: Setting read lock. As you can see the Kerberos stack does not recognize the active directory account of the client: Instead of t0001 it is looking for “t,,,,,,,,,” and the same applies to the host of the database. You will probably encounter this bug if you are using Oracle 12c on Solaris x64 and either the database hostname or the client user’s Active Directory account contains numbers. The patch for this bug will not be included in any PSU so you will need to download it and install it on all of your Oracle 12c homes if they are on a Solaris x64 platform. In both cases a user with password authentication tries to login to the database and fails. Even if SQLNET.FALLBACK_AUTHENTICATION is set to TRUE password identified users cannot login to the database. The root cause for this problem is that Fallback only works if a Kerberos ticket expires. In case the Kerberos configuration is corrupted or in this case the database cannot do Preauthentication, fallback cannot happen and the ORA-12638: Credential retrieval failed message is raised. If the kerberos ticket expires every 8 huours for example you might schedule the script to run every 6 hours like in my example above. First we have to make sure that the SPN of the Oracle Instance host is able to use AES 256 encryption. 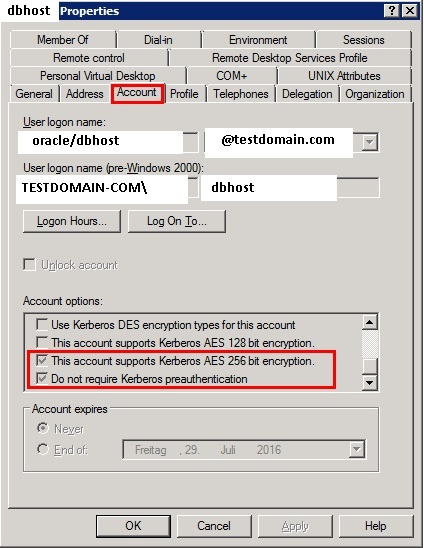 This can be enabled by setting the following Active Directory attribute of the SPN: “This Account supports Kerberos AES 256 bit encryption”. This setting can be found on the Account tab of the Active Directory user as shown on the picture in the preauthentication section. Make sure that the domain name is written with capitals. Succesfully mapped oracle/dbhost to dbhost. As you can see above the only encryption allowed by this keytab file is the AES 256 encryption. Have you ever seen this error on the windows client side? (7148) [07-JUL-2017 09:54:32:110] nauztk5ainit: ztk_client_init_context() failed. It seems to be looking for the kerberos conf file on the windows client using the conf parameter in the sqlnet.ora file on the DB server. The windows client has the conf parameter set pointing to a different local directory.